This saddle is VERY lightly used. 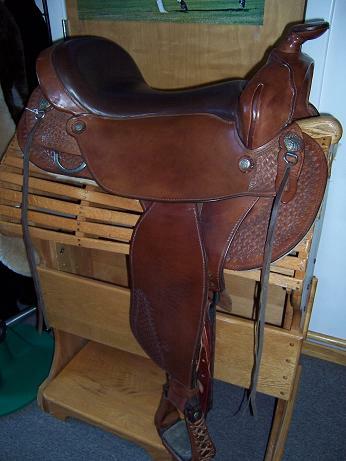 It is in excellent condition and features a plush seat for extra cushion, nice basketweave tooling on the skirts, and silver pegasus conchos. Very comfortable saddle! This is a very hard to find model! Brown cowhide and dark brown upholstery leather in the seat. Seat size is 17" and it has a regular width tree with system II panels. 3/4" dropped yoke rigging. The Trail Pardner is the shortest tree in Ortho-Flex's western line. A popular trail saddle, the Trail Pardner fits a variety of horses from Arabs to flat-backed Quarter horses. The Trail Pardner’s many features include: a 7 ½" gullet, 5" supportive cantle, thigh grooves in the swell, and a generous flat seat. The Trail Pardner is truly a versatile saddle. Available in 13 through 17 inch seat size. Approximate weight - 28 pounds.